The world of wine is vast. It is more than California, France and Italy. It is more than chardonnay, sauvignon blanc, pinot noir, merlot and cabernet sauvignon. There are more than a thousand wine-producing regions and thousands of different grape varieties in the world. When we see a wine from a lesser-known wine-producing country or made from a grape we are not familiar with or made in a style that is not what we consider classic, we may call these wines “weird” or “archaic” or “artisanal” or “natural.” But it is important to have a broader perspective and look at the larger world of wine. 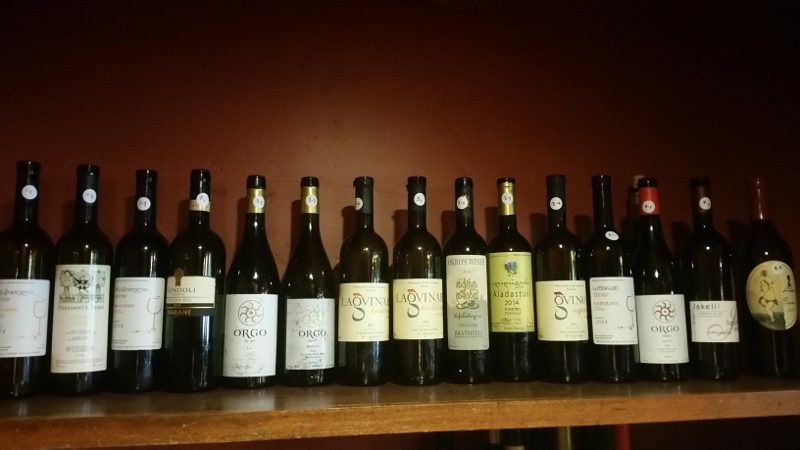 I have had the privilege to be introduced to a vast number of wine regions and wines, and, thanks to my work, I have tried wines from Greece, Portugal, Hungary, Turkey, Lebanon, Israel and Georgia, as well as all wines from the more well-known wine countries. I sat down for the seminar ready to learn about and taste wines from the Republic of Georgia. 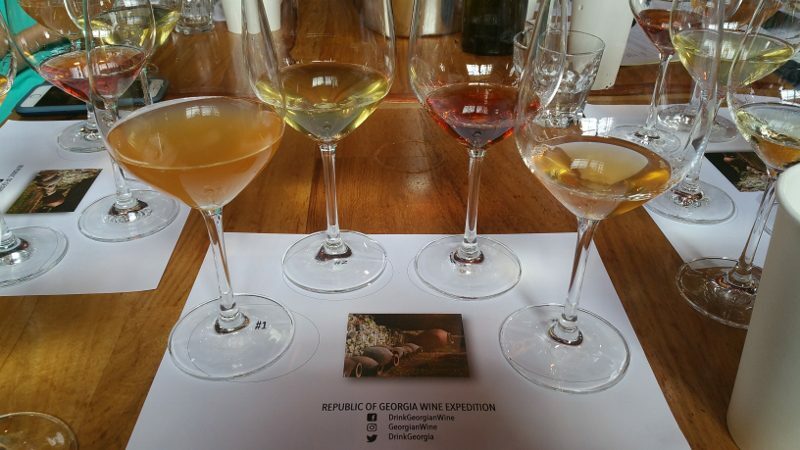 It is a region that I knew very little about and was excited to begin the exploration into wine from what might be the oldest wine-making region on earth: Georgia has been making wine for 8,000 years. But little is known about the wine here in the United States. Despite the 8,000 vintages they have been producing wine, the industry has been affected by the history of the country. Since the Middle Ages, Georgia has been invaded by other countries. Each time a new invasion came in, the vines were ripped out. But each time, the families would save some of the vines and plant them in their backyards, propagating them. When the Soviet Union took over, they restricted Georgia to grow only two grapes (rkatsiteli and saperavi) and made them sweet for the Russian market. Again, it was lucky that individuals would hold onto the vines, producing hyper-artisanal wines in their homes and not for commercial use. 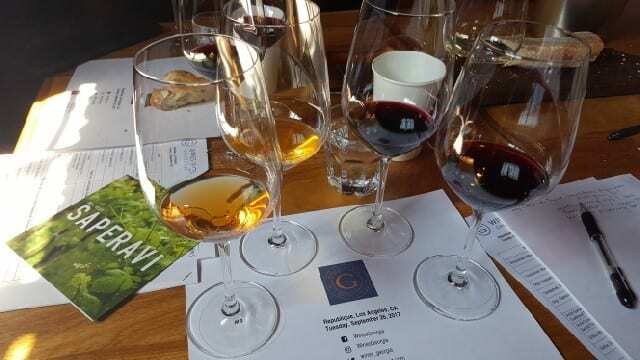 This history is a key part to understanding Georgian wine, Taylor Parsons, wine director of Republique in Los Angeles, explained at the seminar. Parsons recently returned from a first-time, 10-day visit to the county. Parsons also did not know what to expect on his visit as his knowledge of Georgian wine was elementary at best. But, while he says he is still a neophyte, he came home amazed and says that Georgian wine has a place in what we do. In order to find this place for Georgian wines, it is important to start to understand the wines, for which there is little information available. It is also important to understand the wines in context to the legacy of the country. There is a skewed proportion of small producers to large producers. There are no mid-sized wineries in Georgia. Most of the wineries are making 2,000-3,000 bottles per year. There are approximately eight producers who make 7 million bottles per year, about the same production amount as the 10th biggest winery in the United States. I knew tasting the wines of Georgia would be different. But as they came around and poured the wines, a wine novice would question what was in front of them. Instead of the bright lemon or golden colors of white wines, the white wines ranged from yellow and golden to pale peach and orange. The red wines, however, are more the typical shades of purple, ruby and garnet that we are familiar with. The wines are made in large vessels called qvevri, which means “below.” These are concrete tanks built underground. If you are a fan of “The Amazing Race,” you will understand what I am talking about as this past season the teams were required as one of their challenges to clean out grapes skins from the qvevri at a winery in Georgia.